Users in China accessing a different territory’s App Store (i.e. they have indicated their billing address to be outside of China) are not impacted; they can download the iOS app and continue to receive updates as before. While Apple’s decision is surprising and unfortunate, it does not change ExpressVPN’s commitment to keeping you securely and reliably connected. Our support team stands ready 24/7, including via live chat, to help any impacted users. Our commitment to an open and free internet remains stronger than ever, and we will continue the fight in helping our users to stay connected, no matter where they are located. 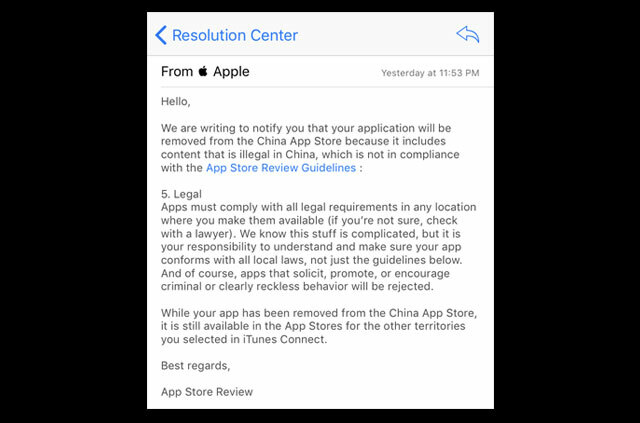 Screenshot of the notification ExpressVPN received from Apple about the removal of ExpressVPN’s iOS app from the China App Store.